Do you want BDS Admission in Dental colleges of India? Are you searching for Top Dental colleges to study Bachelor of Dental Surgery? If your ambition is to become a doctor, studying the BDS course is one of the best options after MBBS. Dentistry is among one of the popular profession in India for dental doctors. It is a branch of medicine which involves the study, diagnosis, prevention & treatment of teeth & oral cavity. To get BDS admission in India, appearing in the NEET UG exam is the only option. Check out this latest guide to learn about BDS Admission in India. BDS course is properly abbreviated as Bachelor of dental surgery. BDS is an undergraduate course that is done in the field of dentistry. Aspirants who pursue this course become a dentist. The duration of the BDS course is of 5 years which includes 4 year of study and 1 year of compulsory internship. It is followed by a 3 years Masters of Dental surgery (MDS) course in different specializations. To become a good dentist, You must study the BDS & MDS course. BDS is the study of teeth and also involves the study of different parts of the head enclosing the brain and face. The Majority of Dental doctors provides treatment of oral & gum diseases. A Dentist can work in a dental hospital or in any private clinic. The common job dentist is restoration, extraction or surgical removal of teeth, scaling, and root canal treatment. There are more than 300 colleges in India that are providing BDS course. You must fulfill the eligibility criteria and appear in the entrance exam for BDS admission. 1) You must have passed class 12th (10+2) boards exams successfully. 2) Must have minimum 50% marks in Physics, Chemistry & Biology subjects in class 12th boards exam. You must have completed Senior Secondary examination with at least 50% marks to pursue the BDS course. Furthermore, You must have studied physics, chemistry, biology, and English as the main subject in class 12th. NEET UG entrance is conducted for admission in Bachelor of dental surgery course. On the basis of performance in the entrance test, You can get BDS admission. You must have good physical stamina & interest in Medical science to pursue Bachelor of dental surgery course. Before making BDS course Your career choice it is important that your parents have interest in dentistry. To complete the BDS course, You must have a strong mind, ability to handle the obnoxious smell and sight while performing the physical experiments. To get admission in bachelor of Dentist dental surgery course, it is important for You to qualify the entrance examination. The only entrance exam for Bachelor of dental surgery course admission is the NEET UG. Apart from NEET UG, there is no other entrance examination held. NEET UG exam score is accepted for BDS admission in dental colleges of India. In other words, Dental colleges recognized by the Dental Council of India will take admission via the NEET-UG entrance exam. Top universities such as Banaras Hindu University & Aligarh Muslim University offering BDS course accept the NEET UG score for admission. National Testing Agency (NTA) is conducting the NEET-UG 2019 entrance exam for BDS admission. Ministry of Human Resource Development, India has mandated the NTA to conduct NEET UG from 2019 onwards. 1) It will conduct the NEET UG 2019 entrance exam. 2) Announce the results of NEET UG 2019 exam. 3) Provide All India Rank Merit list for All India quota & Deemed University seat counseling. 4) Provide NEET Exam result to state counseling authorities for state quota seat counseling. Click the link below to learn more about the NEET UG Exam, eligibility criteria, cut-off Score, exam syllabus & schedule. 1) Domicile student of the State. 2) Reservation of seats for the State students. 3) Management & NRI Quota Seats for BDS Direct Admission. If You have qualified the NEET UG exam and fulfill all the norms of the organization then only You get admission in the BDS course. BDS seat allotment under All India Quota & Deemed University is done by Directorate General Of Health Services. To apply for counseling & college selection, Medical Counseling Committee will invite all eligible applicants. On the other hand, Government & private Dental institutions recognized by the state university will conduct their own separate counseling. All state counseling authorities will follow their own rules & regulation for BDS Seat allotment. On the basis of marks scored in the NEET UG exam, all counseling authorities will allocate the BDS seat as per Your merit. Click the link below to learn more about MCC & All-State Counseling Authorities, Procedure, Application Fee, Domicile requirement & Schedule. There are several research Institutions, dental product & equipment manufacturers, hospitals, pharmaceutical companies offer job opportunities to a BDS candidate. 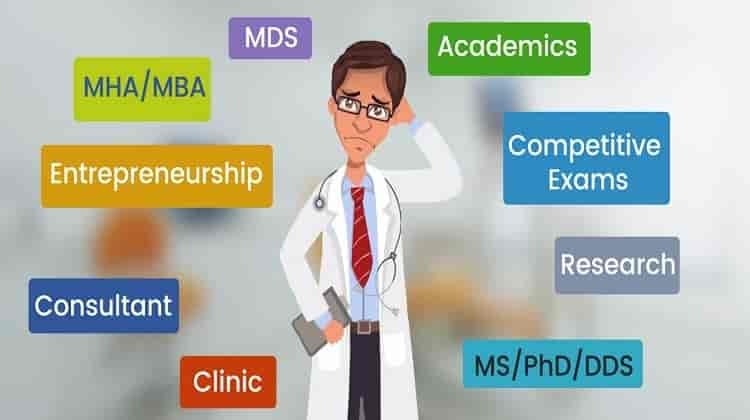 Many educational institutions, universities having BDS courses have private practicing doctors and several other that that demand a BDS candidate. Furthermore, candidates who pursue Masters in dental surgery can also go for the research Jobs or government doctor jobs. In India and even in Abroad there is a vast scope for dental candidates. There are several companies that are providing the best career options to candidate having a BDS degree. With over 313 dental institutions & more than 5000 dental laboratories in India, the Dental industry is quite vast. It is predicted that India will become one of the largest dental market using dental products & materials. There are a lot of multi-specialty hospitals in India offering general dentistry and specialist treatments. More than 99% of the Dental industry is private in India. Job opportunities for a dentist are relatively less in both public and private sector. More than 90% of Dentist have set up their own private clinic around the major cities of India. Every year approximately 12000 to 15000 dentist, starts a dental practice in India. 1) Increase in the population & Income. 2) Growing awareness of dental care. 3) Technological Advancement in the field of dentistry. 4) Introduction of new products to reduce patient discomfort and shorten healing time. Around 47.2% of the total population above 65 year age suffers from periodontal diseases. After completing the BDS course, You can go for the post graduation course in dentistry. To get admission in Bachelor of dental surgery You needs to pay the average tuition fees of rupees 50000 to 8 lakh per annum. Even there are several colleges that provide a BDS seat in low fee on the basis of marks scored by the candidates in the NEET entrance exam. 1) Govt Dental Colleges: Rs 10,000 – 1 Lakh per annum. 2) Deemed Dental Colleges: Rs 5 Lakh – 7 Lakh per annum. 3) Private Dental Colleges: Rs 3 Lakh – 7 Lakh per annum. Through Management quota seats you get Direct Admission in BDS Course. You must qualify the NEET UG Entrance test for the current academic session to get Direct Admission in BDS. Up to 20% of BDS seats in Private Dental colleges & all seats in Deemed Dental Colleges are under NRI & Management Quota. NRI quota seat is for NRI, OCI, PIO & Foreign national students who want BDS direct admission in India. BDS Management quota seat is for India national students with a low qualifying score in NEET UG exam. BDS seat in Top private college is available for Direct Admission at the stray vacancy counseling. All Private & Deemed Dental college conducts their own Stray Vacancy Counseling at the college level after the Mop Up Round counseling. It is conducted for BDS Direct admission in vacant seats after the Mop Up round counseling is over. BDS NRI, Management quota seats remain vacant even after conducting 3 round of counseling at center and state level. Because of the high annual tuition fee of the NRI & Management quota seat, many seats are available after the Mop-up counseling. These Vacant BDS seats are available at a discounted price at the college level counseling. Karnataka has the highest number of BDS Seats in India. There are 47 Dental colleges in Karnataka offering the BDS Course. Students from other state are eligible for admission in private & deemed dental colleges in Karnataka. 1) 35% of ComedK seats for All India NEET UG Eligible students. 2) 15% of NRI Quota Seats for NRI, OCI, PIO & Foreign National. 3) 5% of Management Quota Seats for BDS Direct Admission. We assist You in BDS Direct Admission without Donation in Top Dental College. The Demand for BDS Course is comparatively less than MBBS in India. Admission in BDS is one of the best career options if You want to pursue a career in Health Science & Dentistry. 1) If Your ambition is to become a dentist. 2) Secured only qualifying marks in NEET UG Entrance exam. 3) If you don’t have a budget to pay for MBBS Management seats. We hope with the help of above-given information it will become easier for You to understand the requirements for a BDS Course admission. If you have any doubts regarding the BDS Admission?